With an advanced construction design, the Cobra Chrome AV91 / AV92 delivers improved stability and durability in all conditions for precise feel and tyre feedback. Avon have revised the tread pattern, which has incrased the footprint by around 5 percent to maximise grip. The latest compound technology is said to improve tyre life by 10 percent compared with its predecessor. The use of enhanced compounds means that the Cobra Chrome offers excellent wet braking and handling properties. 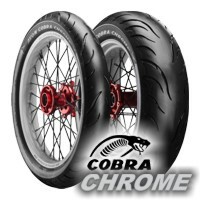 I've been using Avon Cobras for years and love them but the Avon Cobra Chrome tyres are amazing very grabby in the turns with positive feed back. I'm curious as to how many miles I can put on them before need ing new ones. Initial review Avon Chromes are very nice . we'll see how they wear in order to give a better assessment.